The cryptocurrency market has seen a lot of ups and downs since the start of the bear attack which has directly affected the prices, market caps, and other metrics. Since the start of March, the prices have seen a slight increase with Bitcoin seeing a steady hold above $4000. There has also been a steady increase in the hash rate of Bitcoin, which means that the number of people coming into the Bitcoin ecosystem has increased. 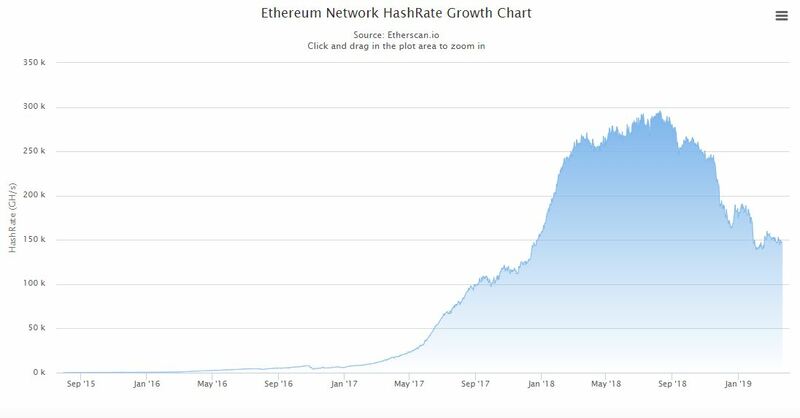 According to the charts, Ethereum’s hash rate had peaked sometime around August 2018 after which it had continuously fallen to settle at its current hash rate of 147.221 billion hashes per second. At the same time, Bitcoin’s hash rate was at 47.567 trillion, a stark increase from its fall to 32.728 trillion before the end of 2018. Bitcoin’s resurgence in its hash rate was shown recently when it recorded a 4-month high on the charts. On March 19, Bitcoin’s hash rate increased to 52 quintillion hashes per second, the highest it had reached since November 2018, when the hash rate spiked to 54 quintillions. The highest hash rate ever recorded in the Bitcoin ecosystem was 62 quintillion hashes per second which was achieved in August 2018.